Remember the days before digital? We shared objects and ideas by actually handing over a physical item like a cassette tape, a hand-written note or a photograph. Oksu is a concept that brings back the idea of exchanging physical objects by printing out physical representations of links, songs, articles, movies and letting you pass them on to friends. Oksu was designed by Alex Zhulin to give people a way to share their favorite things digitally….but with a whimsical physical element. 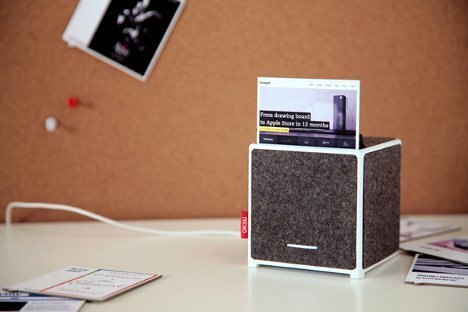 The little cubical printer spits out small speech bubble shaped pieces of paper that include both physical and digital cues to represent whatever you want to share. The physical part of the paper is printed without ink using Z-Ink technology, in which the color pigments are already present within the paper just waiting to be activated by the printer. When you find a link, story, photo, video or other bit of data that you want to share, you print it out on the special paper which includes an NFC (near field communication) chip in the middle. 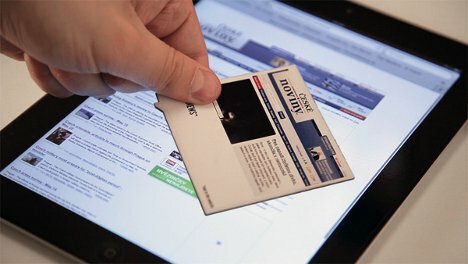 The person who receives the printout can view the data by placing the printout near any gadget that can read the NFC chip. The printout can then be kept as a permanent physical reference to call up the data again and again, or just to serve as a reminder of some fun thing once shared by a friend.